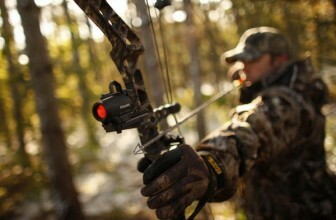 Choosing the right bolt for your crossbow can be something of a difficult task. 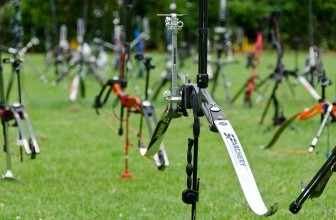 There are many things to take into consideration when searching for the best bolts for your bow. Even the type of target can affect which type of bolt you choose. As the choices can be overwhelming, it can help to have a guide to help you on your way. 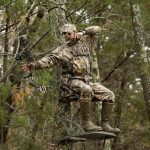 Tac x Tactical have gathered together several different options to help you find a suitable bolt for your crossbow and get the most out of your archery. First, you should know that while some people refer to crossbow bolts as “arrows,” the only difference is that a “bolt” can only be used on a crossbow and never with a regular bow. The average crossbow bolt is 20 inches, and you should check with your crossbow specs to ascertain the length of the bolt that you require. You’ll need to assure that both the field points and broadheads you use are of the same weight and that this weight is exactly the same as the weight of the heads you received with your crossbow bolt. Never use bolts that are lighter than what is recommended by the manufacturer. You can use a heavier bolt without issue, but lighter bolts can cause your crossbow to malfunction and possibly inflict injury on yourself. While most crossbows you buy will come with bolts and target practice field points, you will have to buy the hunting broadheads separately. When choosing your bolts for your crossbow, make sure to always read the manufacturing specs that came with your device. You want to get the best results possible, and not damage your bow or yourself! 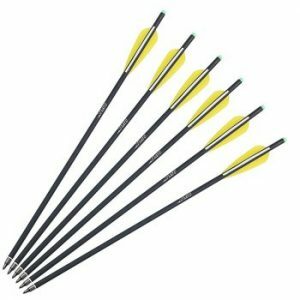 This pack of crossbow arrow bolts has a varying price, depending on the number of bolts you choose. The bolts have received 4.1 out of 5 stars. 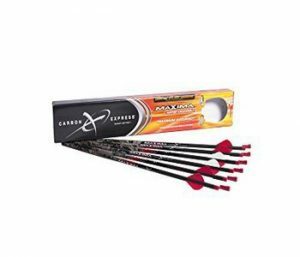 Some of its features include strong, lightweight carbon shafts, improved wall thickness for added durability, 13.78 grains per inch, crossbolt matched with 125-grain Broadhead for optimal accuracy and target. Bolts come with standard 4” vanes and inserted moon nocks, and removable tips to attach broadheads. The reviews for these bolts are somewhat mixed. A lot of people said they were really good for practice, but they wouldn’t want to take them into the field. Most people seem satisfied with what they received for the price they paid, though a few had trouble with the bolts being straight, and one or two commented that the fletching wasn’t perfect. All in all, not a bad bolt for the price. These bolts come in 22-inch and 20-inch. They have received an average of 4.7 out of 5 stars. According to thei r product description, they are designed for the hunter who wants “ultimate penetration.” Some of their other features include A CX lineup that creates maximum kinetic energy and great knock-down power and advanced construction that ensures spine consistency for greater accuracy. They come with standard 4” vanes, inserted moon nocks, plus 6 universal flat nocks. Most of the reviews for these bolts are very good. A few people complained that they were heavier than they expected, but that didn’t seem to make them not want to purchase again. Quite a few people mentioned that their accuracy was top-notch and improved their shooting, and held up to wear and tear. The majority of reviewers were very happy with their purchase, and more than a few mentioned they would be buying them again. ADVANCED CONSTRUCTION - Ensures spine consistency for greater accuracy. The composite material is extremely durable at impact for exceptional reliability and repeat performance. CONFIDENCE IS KEY - Designed for the hunter who wants ultimate penetration, the PileDriver Crossbolt instills supreme confidence when tracking even the largest of prey. This pack by Barnett has received 4.5 out of 5 stars. 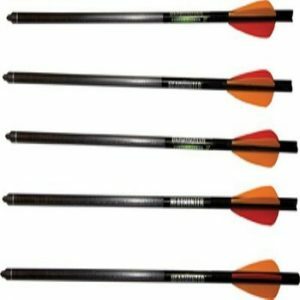 These arrows feature half-moon nocks, lightweight carbon shafts, improved wall thickness for durability, optimal accuracy and target penetration, and also include 24F field point and moon nocks. They are compatible with Ghost 350, Penetrator, Wildcat C-5, and Jackal crossbows. A five-year limited warranty is also included with these arrows. The reviews for these bolts are very good, overall. A lot of people commented on how straight they fly, and their accuracy. Most stated that they are great quality bolts for the price. A few people here and there weren’t fans, because of differing reasons. Some said the accuracy wasn’t great, and others were unhappy with the condition they arrived in, but most reviewers seemed to love their purchase and will buy again. These bolts come in varying pack sizes. They have received a review average of 4.2 out of 5 stars. 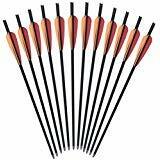 Th ese arrows are 13.78 grains per inch, matched with 125-grain Broadhead and have excellent accuracy and penetration. They feature strong, lightweight carbon shafts and improved wall thickness for added durability. They have removable tips to attach broadheads and come with standard 4” vanes and inserted moon nocks. 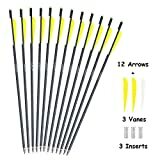 The reviews for these arrows are fairly good. Most people seem satisfied with their accuracy and speed. Quite a few people mentioned that they shoot straight and loved the product for the price they spent. A few people also mentioned their durability. These appear to be a good investment for their price, as most people seem very happy with their purchase. This pack of 6 bolts has received 4.5 stars out of 5. They feature dual spine weight forward technology for rapid recovery and optimizing trajectory to ensure greater down-range shot placement, and a precision design with patented BuffTuff Plus carbon weave for superior strength and accuracy. 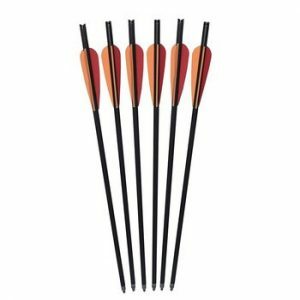 They have high-performance vanes, 100-grain field point, inserted moon nocks, and also come with 6 universal flat nocks. The reviews for these bolts are overwhelmingly good. Many people stated that they were the most accurate bolts they’ve ever used and are very durable; one even commented that they don’t shatter when they hit rocks. 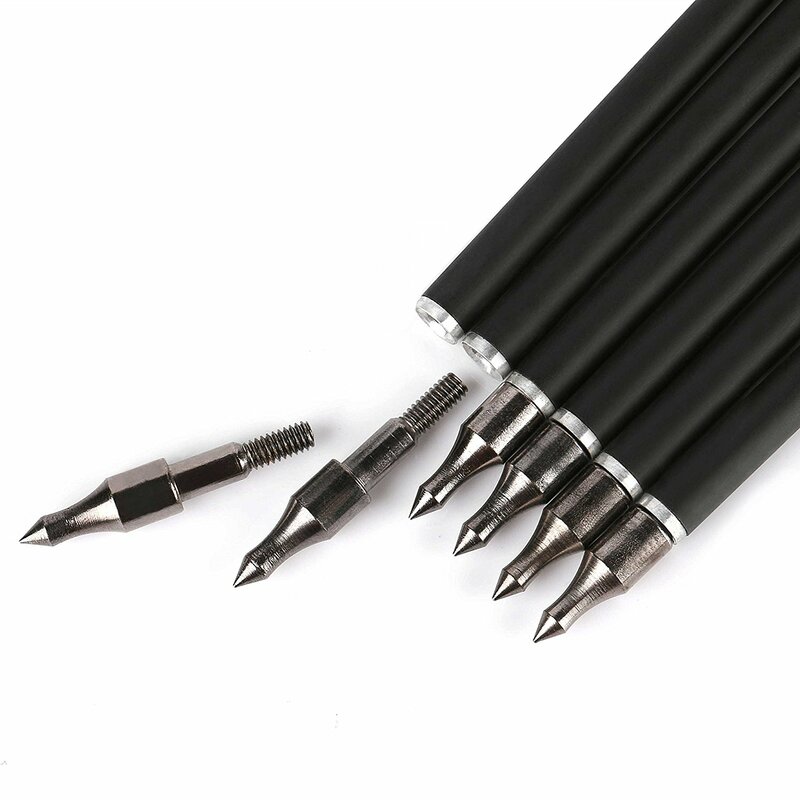 There were a few reviewers who stated one or more of their bolts came with a few problems, but for the most part, everyone who has purchased these appears to love them. The majority of people who definitely recommend this product to anyone wanting to invest in a set of strong and accurate bolts. 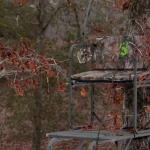 MOSSY OAK TREESTAND CAMO - Helps make the Maxima Hunter the most proven camouflage bolt in the Carbon Express lineup.